The Four Pools Industrial Estate is sprawling around the bypass area, and includes some facilities which make up a signposted service area. 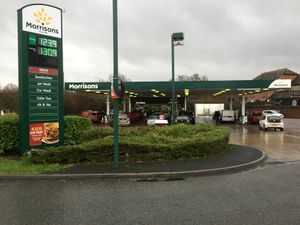 There is a Frankie & Benny's and the main Morrison's supermarket on the opposite side. The former Four Pools Little Chef building, now home to Frankie and Benny’s. The site is sometimes known as The Link, after the street address. A Little Chef was built opposite what we now consider to be the services in 1989. 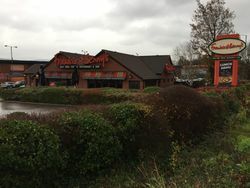 It gained a Burger King but closed in 2007 and became Frankie and Benny's. The main service area was built in 1998. The Morrisons was previously Safeway.